AProf Stephen Anderson is a physiologist with expertise in endocrinology. Stephen completed an Agriculture Science degree (University of Sydney) and then a PhD in reproductive endocrinology at Armidale (University of New England and CSIRO Animal Production). After his PhD, Stephen moved to UQ and changed focus to biomedical research. He undertook NHMRC post-doctoral research in neuroendocrinology examining the hypothalamic control of anterior pituitary hormones. Since 2000 Stephen has been a teaching and research academic in physiology at UQ, and is currently in the Faculty of Medicine. In research Stephen interests lie in the nexus between biomedical and animal science. The overall theme of Stephen's work is to better understand the physiology of animal health and disease. Some of his current projects examine northern Australian beef cattle (phosphorus deficiency and regulation of appetite), feedlot grain-fed cattle (heat stress), horses (laminitis), and cats (flea sensitivity, diabetes). During his academic career Stephen has taught physiology into many biomedical, medical, health, animal, and veterinary science courses. He currently teaches into Science, Biomedical Science, Medicine, and Pharmacy degree programs. Stephen has taught in excess of 28,000 students at UQ. He has been the recipient of many teaching and learning awards, including an Australian Learning and Teaching Council Citation. Stephen has a keen interest in self-regulation of learning by students and life-long learning. 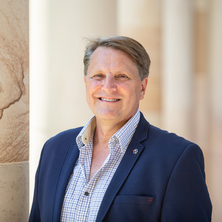 For 2019 Stephen holds a UQ teaching fellowship in the Institute of Teaching and Learning Innovation (ITaLI). Understanding and promoting growth in cattle. The physiology of P and Ca mineral metabolism in animals. Phosphorus deficiency in grazing cattle. Biomarkers of P status. Inflammation and metabolism in cattle under heat stress. Novel treatments to lower stress responses in animals. Insulin insensitivity in pregnant mares. Pathophysiological mechanisms in equine laminitis. Meat and Livestock Australia news release about our research on phosphorus nutrition in northern Australian beef cattle. Stephen acts as scientific consultant for National Geo documentary series "Moody Beasts" produced by Wildbear Entertainment (2016), a quirky look at how hormones drive animals wild. Stephen was the plenary speaker for a continuing professional developmental conference for registered nurses, "Linking Hormones to Illness" run by Ausmed (2015). Stephen was part of a team of Indonesian and Australian scientists working on an Australian Centre for International Agricultural Research project based in Indonesia and Northern Australia (2009 to 2014). A key aim of this work was to improve cow productivity for small-holder farmers in Indonesia. Colthorpe, KL, Nalliah, J, Anderson, ST and Curlewis, JD (2000) Adrenoceptor subtype involvement in suppression of Prolactin secretion by Noradrenaline. Journal of Neuroendocrinology, 12 4: 297-302. Colthorpe, KL, Anderson, ST, Martin, GB and Curlewis, JD (1998) Hypothalamic dopamine D1 receptors are involved in the stimulation of prolactin secretion by high environmental temperature in the female sheep. Journal of Neuroendocrinology, 10 7: 503-509. Benvenutti, M., Dixon, R. M., Goodwin, K. L., Kidd, L., Mayer, R., Fletcher, M. T. and Anderson, S. (2015). Responses of Bos indicus cows in early lactation to dietary phosphorus deficiency. In: Recent Advances in Animal Nutrition in Australia, Armidale, NSW, Australia, (47-48). 26-28 October 2015. Can long-term differences in phosphorus nutrition affect glucose homeostasis in growing steers? McNeill, D. M., Anderson, S. T., Quigley, S. P., Kidd, L. J., Gout, C. R., Moate, P. J. and Poppi, D. P. (2012). Can long-term differences in phosphorus nutrition affect glucose homeostasis in growing steers?. In: M.A. Friend and G.L. Krebs, Proceedings of the 29th Biennial Conference of the Australian Society of Animal Production. 2nd Australian and New Zealand Societies of Animal Production Joint Conference, Christchurch, New Zealand, (7-7). 2-5 July 2012. Cawdell-Smith, A. J., Anderson, S. T., Todhunter, K. H., Perkins, N. R. and Bryden, W. L. (2012). Endocrine responses in Processionary caterpillar induced EAFL. In: Proceedings of the 4th Australasian Equine Science Symposium. 4th Australasian Equine Science Symposium, Gold Coast, Australia, (65-65). 13-15 June 2012. Quigley, S. P., Anderson, S. T., Poppi, D. P., Isherwood, P., Costa, D. and Nattrass, G. S. (2012). Gene expression in the arcuate nuclei of sheep fed diets of variable protein and energy content. In: M.A. Friend and G.L. Krebs, Proceedings of the 29th Biennial Conference of the Australian Society of Animal Production. 2nd Australian and New Zealand Societies of Animal Production Joint Conference, Christchurch, New Zealand, (22-22). 2-5 July 2012. Quigley, S. P., Poppi, D. P., Anderson, S.T., Isherwood, P., Costa, D. and Nattrass, G. S. (2012). Gene expression in the liver of sheep fed diets of different protein and energy content. In: M.A. Friend and G.L. Krebs, Proceedings of the 29th Biennial Conference of the Australian Society of Animal Production. 2nd Australian and New Zealand Societies of Animal Production Joint Conference, Christchurch, New Zealand, (40-40). 2-5 July 2012. Dobbs, T. N., Foote, C. E., Cawdell-Smith, A. J., Anderson, S. T., Boston, R. C. and Bryden, W. L. (2012). Glucose and insulin dynamics in mares and their foals. In: Proceedings of the 4th Australasian Equine Science Symposium. 4th Australasian Equine Science Symposium, Gold Coast , Australia, (56-56). 13-15 June 2012. Anderson, S. T., John, S., Dobbs, T. N., Foote, C. E., Cawdell-Smith, A. J. and Bryden, W. L. (2012). Hormonal phenotypes of thoroughbred yearlings with osteochondrosis. In: Proceedings of the 4th Australasian Equine Science Symposium. 4th Australasian Equine Science Symposium, Gold Coast, Australia, (64-64). 13-15 June 2012. Cawdell-Smith, A. J., Anderson, S. T., Liu, A. and Bryden, W. L. (2012). Lactation is associated with increased circulation oestradiol levels in mares at ovulation and throughout early pregnancy. In: Proceedings of the Australasian Equine Science Symposium 2012. 4th Australasian Equine Science Symposium, Gold Coast, Australia, (54-54). 13-15 June 2012. Anderson, S. T., Song, X., Velez Aramburo, M. E., Bartels, R., Cawdell-Smith, A. J ., Foote, C. E., Boston, R. C. and Bryden, W. L. (2012). Mares of lower body condition score exhibit marked insulin resistance and reduced insulin secretion in late gestation. In: Proceedings of the 4th Australasian Equine Science Symposium. 4th Australasian Equine Science Symposium, Gold Coast , Australia, (36-36). 13-15 June 2012. The relationship between insulin status and osteochondrosis in thoroughbred yearlings. Dobbs, T.N., Foote, C.E., Cawdell-Smith, A.J., Anderson, S.T. and Bryden, W.L. (2012). The relationship between insulin status and osteochondrosis in thoroughbred yearlings.. In: Proceedings of the Australasian Equine Science Symposium 2012. 4th Australasian Equine Science Symposium, Gold Coast, QLD, Australia, (26-26). 13-15 June 2012. Barton, K.D., Foote, C.E., Cawdell-Smith, A.J., Anderson, S.T., Boston, R.C. and Bryden, W.L. (2011). Dietary protein level and glucose and insulin dynamics in mature geldings. In: Recent Advances in Animal Nutrition in Australia, Vol.18, 2011. Recent Advances in Animal Nutrition in Australia, UNE, Armidale, NSW, Australia, (96-97). July, 2011. Dobbs, T.N., Foote, C.E., Cawdell-Smith, A.J., Anderson, S.T. and Bryden, W.L. (2011). Fasting insulin status and osteochondritis dissecans in Thoroughbred yearlings. In: Recent Advances in Animal Nutrition in Australia. Recent Advances in Animal Nutrition in Australia, Armidale, NSW, Australia, (95-96). July 2011. Dobbs, T.N., Foote, C.E., Cawdell-Smith, A.J., Anderson, S.T., Boston, R.C. and Bryden, W.L. (2011). Glucose and insulin dynamics in neonatal foals: influence of maternal diet. In: Journal of Equine Veterinary Science. 2011 Equine Science Society Symposium, Murfreesboro, Tennessee, (277-277). 31st May - 3rd June 2011. Cawdell-Smith, A.J., Todhunter. K.H., Anderson, S.T., Perkins, N.R. and Bryden, W.L. (2010). Caterpillars and equine fetal loss: An Australian perspective. In: 10th International Symposium on Equine Reproduction. 10th International Symposium on Equine Reproduction, Lexington, KY, U.S.A., (S349-S350). 26-30 July, 2010. Barton, K. D., Foote, C. E., Cawdell-Smith, A. J., Anderson, S. T., Boston, R. C. and Bryden, W. L. (2010). Equine insulin dynamics and dietary protein. In: Proceedings of the Australasian Equine Science Symposium 2010. 3rd Australasian Equine Science Symposium 2010, Gold Coast, Australia, (34-34). 3-5 June 2010. Dobbs, T. N., Foote, C. E., Cawdell-Smith, A. J., Anderson, S. T., Boston, R. C. and Bryden, W. L. (2010). Glucose and insulin dynamics in gestating mares and foals. In: Proceedings of the Australasian Equine Science Symposium 2010. 3rd Australasian Equine Science Symposium 2010, Gold Coast, Australia, (28-28). 3-5 June 2010. Hisham, M. N., Quigley, S. P., Anderson, S., Phillips, N. J., Loor, J. J. and D'Occhio, M. J. (2010). Liver gene expression in suckled and weaned beef cows. In: 7th Asian Reproductive Biotechnology Society Conference, Kuala Lumpur, Malaysia, (16-16). 8 - 10 November 2010. Dobbs, T. N., Foote, C. E., Cawdell-Smith, A. J., Anderson, S. T. and Bryden, W. L. (2010). The relationship between insulin status and OCD occurrence in thoroughbred yearlings. In: Proceedings of the Australasian Equine Science Symposium 2010. 3rd Australasian Equine Science Symposium 2010, Gold Coast, Australia, (36-36). 3-5 June 2010. Is prolactin-releasing peptide (PrRP) a hypophysiotrophic factor in the ewe? Anderson, S. T., Nalliah, J. and Curlewis, J. D. (2001). Is prolactin-releasing peptide (PrRP) a hypophysiotrophic factor in the ewe?. In: C. Doberska, Proceedings of the Society for the Study of Fertility Annual Conference. Society for the Study of Fertility Annual Conference, Cambridge, University of Cambridge, (24-24). July. Anderson, S. T., Nalliah, J. and Curlewis, J. D. (2001). Prolactin-releasing peptide (PrRP) and the control of prolactin secretion in the ewe. In: Editrice Kurtis, 5th European Congress of Endocrinology Abstract Book. 5th European Congress of Endocrinology, Turin, Italy, (459-459). 9-13 June 2001. Bennett, C., Anderson, S. T., Kusters, D. H. L. and Curlewis, J. D. (2000). Distribution of prolactin-releasing peptide (PrRP) mRNA and effect on prolactin secretion in the ewe. In: Neuroendo 2000, Hormones on the Brain. Neuroendo 2000, Hormones On The Brain, Opal Cove Resort, Coffs Harbour, Australia, (x-x). 26 - 28 October, 2000. Does PACAP inhibit prolactin secretion via a direct effect on tida neurons? Anderson, S. T., Grattan, D. R., Kusters, D. H. L. and Curlewis, J. D. (2000). Expression of prolactin-releasing peptide (PrRP) mRNA in the rat hypothalamus. In: Neuroendo 2000, Hormones on the Brain. Neuroendo 2000, Hormones On The Brain, Opal Cove Resort, Coffs Harbour, Australia, (x-x). 26 - 28 October, 2000. Anderson, S. T., Grattan, D. R. and Curlewis, J. D. (1999). Distribution of prolactin-releasing peptide (PrRP) mRNA in the rat hypothalamus and medulla oblongata. In: Society For Neuroscience Abstracts. 29th Annual Meeting of the Society For Neuroscience, Miami, Florida, USA, (1183-1183). 23 - 28 October, 1999. Anderson, S. T., Clarke, I. J. and Curlewis, J. D. (1999). Inhibition of catecholamine synthesis in the ventromedial hypothalamus blocks the oestrogen-induced LH surge in ewes. In: Cathie L. Coulter, Proceedings of the Endocrine Society of Australia. The 42nd Annual Meeting Of The Endocrine Society Of Australia, Melbourne, (75-75). 26 -29 Sep 1999. Curlewis, J. D. and Anderson, S. T. (1999). Prolactin-releasing peptide (PrRP) in the ewe: cDNA sequence and distribution of mRNA. In: Society For Neuroscience Abstracts. 29th Annual Meeting of the Society For Neuroscience, Miami, Florida, USA, (1183-1183). 23 - 28 October, 1999.